CMI was proud to present a FREE public talk by Dr. Helen Schwantje in Kimberley, BC on May 1, 2018. Dr. Helen Schwantje is the wildlife veterinarian for British Columbia and responsible for the provincial Wildlife Health Program since 1992. 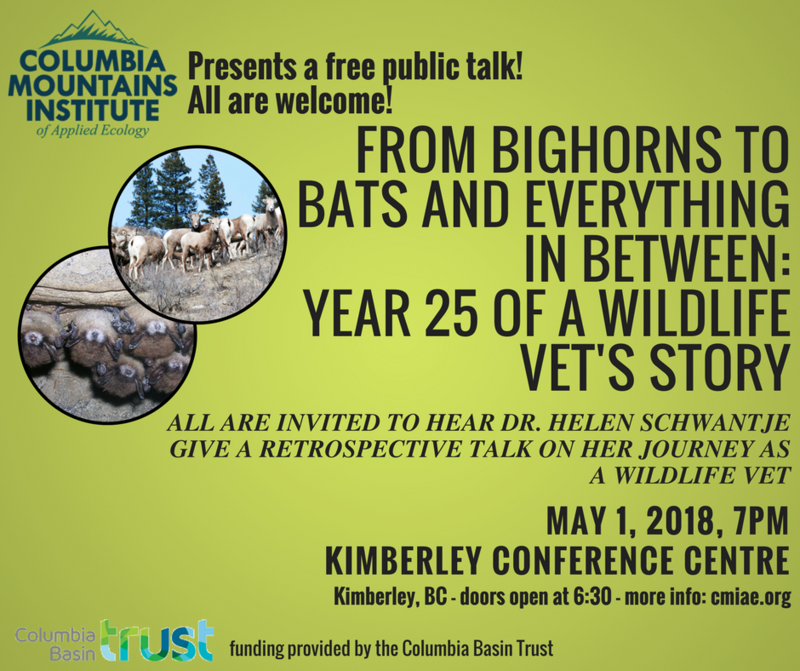 Everyone was welcome to come hear Helen give a retrospective talk titled: “From Bighorns to Bats and Everything In Between: Year 25 of a Wildlife Vet’s Story“. This talk is presented as part of the CMI’s conference: Interdisciplinary Approaches to Managing Health of Fish and Wildlife. This talk is open and FREE to all that wish to attend.